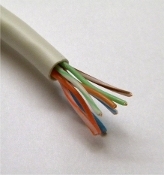 This cable can be used to build your own radio cable for any radio including HTs. It has the RJ-45 for the SignaLink connection already installed, and bare wires on the radio end where you will attach your own connector(s). Note that our Programming Header p/n "SLHEAD" can be used to make your own custom jumper module if one of our stock jumper modules won't work (see "Related Items" below).